Two-tone Rolex watches can be polarizing among watch wearers—some love them, while others can’t wrap their heads around the mixing of two metals on one watch. As big fans of two-tone Rolex watches, we’re obviously in the first camp. If you’re unsure about getting on board with the returning trend of two-tone luxury watches, then take a gander at these three modern two-tone Rolex watches, which could very well sway you in the right direction. 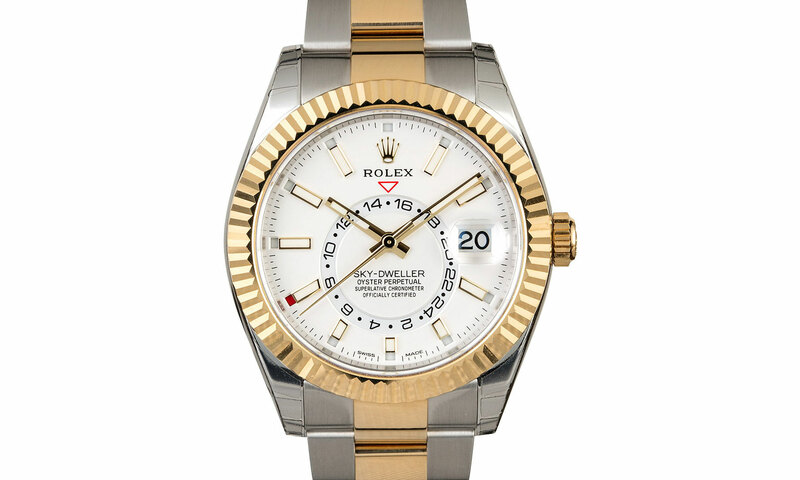 Two-Tone Rolex Watches include the Datejust, Submariner, and the Sky-Dweller. 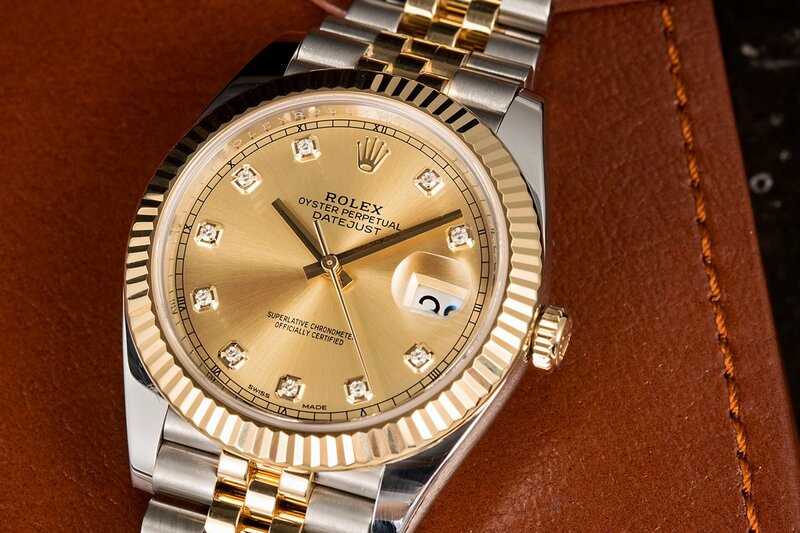 Rolex has been making two-tone watch steel and yellow gold watches since the 1930s. In fact, it was in that decade that the company trademarked the name “Rolesor,” which is the official Rolex term for their two-tone watches. So with that, let’s start with an updated classic—a two-tone Rolex Datejust 41 ref. 126333. Classic because the ref. 126333 has all the Datejust features we’ve come to know and love and updated since it’s part of the larger and upgraded Datejust 41 collection. The Datejust 41 ref. 126333 sports a (naturally) 41mm stainless steel case topped with the familiar fluted bezel in yellow gold and equipped with a yellow screw-down winding crown. Carrying on the golden hue is the champagne dial, which is home to luminescent baton hour markers or diamond hour makers and the famed date window at 3 o’clock. The Rolesor style continues onto the Oyster bracelet with solid yellow gold center links framed by steel outer links. There are sporty Rolex watches that are two-tone. Aside from dress watch, two-tone Rolex watches also come in sportier styles. Take for example the two-tone Rolex Submariner ref. 116613. The combination of robust stainless steel, precious 18k yellow gold, and ultra-modern black ceramic come together to make one highly attractive Submariner. 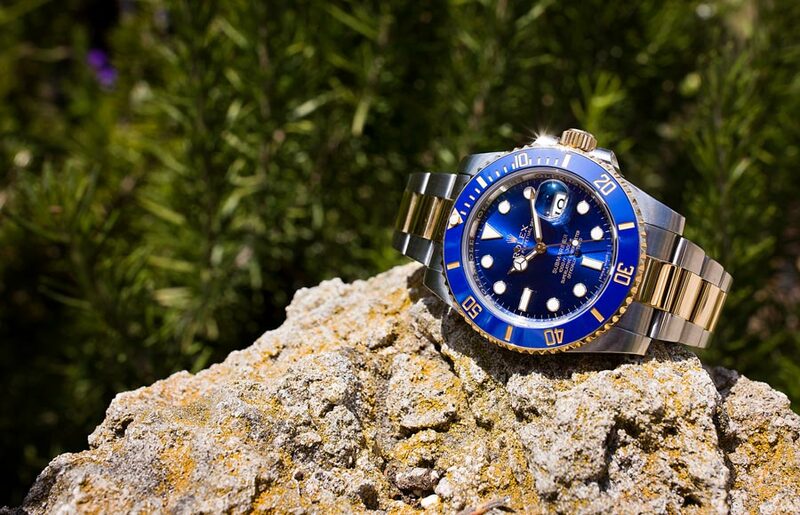 Like all modern Subs, the two-tone Rolex Submariner ref. 116613 includes a 40mm Oyster case waterproof to 300 meters, a Glidelock extension system on the Oyster bracelet, and a unidirectional rotating diver’s bezel. The markings on the Cerachrom ceramic bezel are filled with yellow gold to match the gold details on the case, bracelet, and dial. What are your thoughts on these two-tone watches? The newest model in this two-tone Rolex roundup, the Sky-Dweller ref. 326933 made its debut at Baselworld 2017. This was the first time Rolex made a non-full-gold model of the Sky-Dweller available, thereby significantly dropping the entry price of their annual calendar watch. The Rolex Sky-Dweller ref. 326933 features a large 42mm Oyster case made even more prominent thanks to its yellow gold fluted bezel. The fresh white dial of this particular Sky-Dweller looks especially good contrasting with the yellow gold details sitting above it. While the Sky-Dweller is one of the few Rolex watches available with leather bands, the appeal of a two-tone Oyster bracelet is hard to resist. Although two-tone watches have been a part of the Rolex catalog for eight decades, these modern versions illustrate that wearing a mix of steel and yellow gold is far from passé. Two-tone Rolex watches emphasize that some classics are well deserving of being perennial favorites.